The Israelites set off on their trek to the Promised Land by crossing the Yam Suf. The name does not mean “Red Sea”, but rather “Sea of Reeds”. It is not until about the 3rd century BCE that the identity of the water with the Red Sea was introduced in the Greek version of the Torah, the Septuagint. The Yam Suf was probably a shallow lake near the sea. The route from Egypt to the Promised Land is likely to have been a north-west passage known as “The Way of the Philistines”, a phrase the Torah uses in Exodus 13:17-18. CSA Jarvis, the last British governor of the Sinai Peninsula, endorsed the idea of a northerly route and thought that Yam Suf was Lake Bardawil, which has clumps of reeds on its southern shore. He believed the only area of the Sinai which could have supported the Hebrew people on their trek tom the Promised Land was northern Sinai. This places Mount Sinai not in the south but in the north of the area. Of course everyone asks why it took the Israelites such a long time to get from Egypt to Israel when they really could have done it in about eleven days. The answer which Jewish tradition gives is that the people had to be ready for freedom. A quick dash of eleven days would have been too fast. It would not have welded them together as a self-governing population organised and moulded by Moses and prepared for life as a new nation in its Promised Land. The following article by Rabbi Raymond Apple originally appeared in Festschrift III: Rabbi Dr Shalom Coleman, December 2018. My book, New Testament People: A Rabbi’s Notes, published by AuthorHouse in association with the Australian Council of Christians and Jews (2016), examines almost a hundred New Testament figures from a Jewish viewpoint. I have spent my life studying and teaching Judaism. I have been a Jewish spokesman on many platforms – the pulpit and classroom, the written and printed word, the audio-visual and social media, as well as universities, schools and seminaries – constantly urging the “undimmed eye and unabated natural force” (Deut. 34:7) of the teachings of Moses and the rabbis. I have generally been received with respect, even when I rather shocked my audience. Interfaith involvement has brought me many friendships, but I have also learnt, as Rav JB Soloveitchik says (“Confrontation”, Tradition 6:2, 1964), that it is impossible for a Jew to really get inside the mind of a Christian, and vice-versa. Still, I was moved by Paul van Buren’s view that our age of mutual respect has a radical significance in the long, often difficult story of Jewish-Christian encounter. Van Buren has said: “The church looked at the Jews from its own position and saw only a stubborn refusal to accept what the church preached as the truth. It seems never to have crossed Christian minds that what the church called Jewish stubbornness was, from Israel’s perspective, fidelity to Torah and Torah’s Author” (A Christian Theology of the People of Israel, NY: Seabury Press, 1983, p. 276). There are really two New Testaments – the Gospels which depict Jesus the human being, the Jew, who was more or less a Pharisee and did not intend to forsake Judaism, and the post-Gospel material which depicts the new faith which was built around and upon his figure and preaching. In the first New Testament, Jesus took part in debate, sometimes questioning the traditional view, becoming controversial when he spoke in the first person and claimed special status. No-one is certain how much of his teaching was preserved verbatim, how much was reworked by redactors. Nor can anyone explain why the quiet man of peace is sometimes aggressive and speaks with the robustness of the Dead Sea Scrolls. Nobody can solve all the problems but we can delineate some of them. If we ask whether Jesus would have approved of the New Testament in its Gospel form, no-one can be sure of the answer. He would certainly not endorse the anti-Jewish animus of some Gospel writers or the horror unleashed in his name upon his fellow-Jews. Nor would he seek to escape the fate of the millions of Jews who were crucified in the Nazi Holocaust. Whether or not Martin Buber was right to call Jesus “my great brother”, Jesus himself would have said with the Biblical Joseph, “I go seeking my brethren” (Gen. 37:16). Jewishness is where he came from. His milieu was Abraham, Isaac and Jacob, Moses and Aaron, Elijah and Isaiah, though he believed they had come alive again in him. He saw the upheavals of his time as the pangs of the Messiah and thought of himself in messianic terms. He diverged from tradition in his exegesis of Scripture but he probably had no intention of creating a new religion. In the second New Testament, the post-Jesus generation reconstructed his life, his teaching and status, so that Jesus the Jew became Jesus the Christ and Christianity became a gentile faith, incorporating other influences and interpreting Jesus in ways that radically departed from Judaism. The parting of the ways involved a set of paradoxes: universalism and particularism, faith and works, sin and atonement, death and rebirth, today and tomorrow, earthly man and ineffable God. Sometimes the new faith leant this way and sometimes that. Despite the Jewishness of Jesus, it is important to recognise the way he was re-shaped. Both sides are sure they are right; the question is whether they can live and let live, and both now have to face up to a new factor: a resurgent Islam which is not yet certain whether it can handle the independent spirit and ethos of the other two monotheistic faiths. That encounter must be within a climate of civilised discussion, robust without rancour, argumentative but not aggressive. That is the mood in which I wrote this book, and it is in this mood that I hope it will be read. I am not seeking to dismiss or defeat, but to respect and understand. I am not seeking to denigrate or destroy the other person but to know them. The world is big enough for us all. My book presents two types of New Testament people – the cast of the NT narrative itself such as Jesus, Paul and the apostles, and a range of Old Testament personalities like Adam, Abraham, Moses and Aaron, whom the NT christianizes and regards as prefiguring NT personalities and events. I had to be selective in my choice of NT people (of both categories). Some had to be left for another time. The opportunity to write this article is the “other time”. The article focusses on one of the minor OT figures, Jephthah, on whom Judaism and Christianity part company, each interpreting him differently. What now follows is a Jephthah chapter which could have but did not figure in my book. The story appears in Judges 11 but the text is not as straightforward as it seems. The story is about a warrior chieftain called Jephthah whose Hebrew name Yiftach means “he will open”, maybe because he opened his mouth for a rash vow, maybe because he opened a way for Israel to be free. It is also possible that this a theophoric name with the meaning “God will open (the womb)”. He was the son of Gil’ad (though this may be a place, not a person) with a concubine. Jephthah was made unwelcome by his siblings because he was the son of “another woman”. 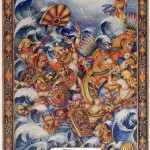 As a warrior he tried to negotiate with the Ammonite enemy but could not avoid war. Despite his apparent piety he used the name of God to make a grandiloquent vow (11:30-31, Ta’an. 4a, Gen. R. 60;3) that if he came home victorious, “whatever comes out of my house to greet me… shall be the Lord’s and shall be offered by me as a burnt offering”. One view is that “and” in this sentence means “or” (Kimchi on 11:31; cf. Ex. 21:15) so that if an unclean animal emerged it would be dedicated to God. Possibly Jephthah expected an animal or slave to be the one to emerge from the house. In the event the one who came out by chance was his only daughter (named by the Midrash as Se’ilah or She’ilah, “asked, demanded, borrowed”) who greeted him with song and dance as was the womanly custom (I Sam. 18:6). Surely Jephthah realised that his daughter might be the one to emerge from the house first (11:35). He cannot have discounted this possibility; nothing suggests that he lacked love for his daughter. (In Shakespeare, Polonius tells Hamlet, “If you call me Jephthah, my lord, I have a daughter I love passing well”). Did he also not imagine that the one who emerged from the house might be his wife, whom he also presumably loved? He was distressed that it was his daughter who met him (11:35) and (if the text means what it says) he even told her she was to blame. Our question remains: does not a good strategist/tactician consider all the possibilities? It was not a new situation: apparently barbarous vows were not unknown in that era (Catholic Encyclopaedia, s.v. “Jephta”). The Midrash thinks God was angry and said, “What will Jephthah do if an unclean animal comes out to meet him?”, which implies that Jephthah has not completely thought out his situation. (Tanchuma Bechukkotai; Midrash HaGadol to Lev. 27:2). The Midrash also says that when Se’ilah came out to greet him she tried to argue that he had legal avenues to save her being immolated, but Jephthah did not concede her point. She went to the Sanhedrin to ask their support, but they were not sure of the law. Neither Judaism nor Christianity sees Jephthah as a major figure. Church teachers attach more theological significance to him and his daughter (Heb. 11:32). Judaism views them more in terms of human dynamics. It thought Jephthah was a bombastic fool who blurted out his vow in self-confidence. As a pious man (11:11) he should have asked God to save his daughter. This contrasts with the Binding of Isaac, where God Himself ordained the offering in the first place and later terminated it (Gen. 22:1,12). He could have annulled his own vow or substituted a money payment but he was too obstinate, though the Mishnah (Ned. 2:1) says that a vow to negate a Torah law is invalid. He could have asked the high priest to annul it but the priest too was stubborn. Did the daughter know of the vow or realise how it might impact her? She might have guessed it, as Isaac deduced from his father Abraham’s actions that there was an intention to sacrifice him (Rashi to Gen. 22:8). As a good daughter who presumably believed that vows had to be kept (11:36) she went along with it (ibid. ), though not without protest, as we have seen. The people are likely to have thought that Jephthah would find a way out. What about the women? In later times they commemorated Se’ilah four days a year (11:40) but female views were probably not given great priority and women presumably went along with a status of inferiority. 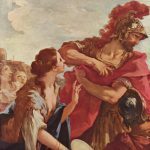 Judaism tends to focus on the father, and it says with regret that even an unworthy ruler like Jephthah must be respected in his generation as Samuel was in his. Several Midrashim describe the bodily or mental ailments that came upon him as a result of his vow. They also posit that the high priest lost his spiritual and moral status as a result of not exerting himself to save Se’ilah from the consequences of her father’s foolish vow. In the NT, Hebrews 11:32 has a high regard for Jephthah, calling him a man of faith like Gideon, Barak, Samson, David, Samuel and the prophets. The Christian Saint Ephraem sees him as a righteous priest who enhanced the service of God. Christian thinking deems the daughter as piously accepting of her fate and being privileged to lay down her life for the Almighty. There is no unanimity as to what happened to Se’ilah. There are two main lines of thinking, both found in Christianity. One approach affirms that she was offered as a burnt offering (II Kings 3:27), prefiguring the Christian notion of self-sacrifice as personified in Jesus, though Judaism is aghast at the notion of human sacrifice (Lev. 18:21, 20:2-5, etc.). The second view (held by most Jewish exegetes and a minority of Christians such as Nicholas of Lyra) is that she survived and – perhaps temporarily – wandered the hills. Some exegetes (Jewish and Christian) believe she was isolated in a specially built edifice where her needs were provided by her father. This may be the origin of a convent or nunnery. Even the Jewish commentaries (Ibn Ezra, Abravanel etc.) know of such institutions being established by Christians. Judaism did not advocate the monastic life; the Jewish emphasis was on holiness within and not outside the community (rabbinic commentators on Lev. 19:2 et seqq., and see notes in JH Hertz, The Pentateuch and Haftorahs). Nicholas of Lyra believed one could be both “sacrificed to the Lord” and still be alive in monastic seclusion. If Se’ilah did live she remained in a state of virginity, never to marry or bear children (11:37-39). For Christianity this was holy virginity, though Judaism gives no support to any such notion and believes that a woman should not be denied or deny herself marriage and procreation (Gen. 1:28, 2:24). Judaism does not see Se’ilah as a heroine, spiritual or otherwise, but as a suffering victim. The story is then an isolated if horrendous incident. On the other hand, St. John Chrystostom claimed that God determined that Se’ilah should be immolated as a warning to human beings not to make rash vows or endanger innocent victims (Church Fathers, Homily 14). 11:39-40 implies that Israelite custom ensured that such events would never happen again. The Encyclopedia Judaica gives a detailed list of the many artistic and cultural depictions of the story, mostly by Christians. They range from Handel to Byron, from 20th century novelists to Yiddish story-tellers. Review by Rabbi Raymond Apple originally published on the Arutz Sheva website on 1 January, 2019. I have reviewed many books in my time but this is one of the very best. It is a Siddur for the modern-age English speaker, a completely re-thought, re-planned and re-worked prayer book that takes account of technical advances in font, layout and binding; linguistic developments in the use of English style; historical events such as the Holocaust and the State of Israel; sociological changes to the place of women in Jewish life; ongoing ideological analyses of spirituality and theology; and developing halachic assessments of how and what to pray. The rubrics are clear and practical, and the book positively invites one to daven. The book took years to put together, but the wait was worthwhile and the result is spectacular. Fortunately it has not followed the aberration of some other new Siddurim which put the Hebrew on the left-hand page and jump counter-intuitively with the placing of their commentaries. Non-orthodoxy is no longer the American norm. Numerically it seems to be declining. Qualitatively it is far less exciting and substantial than orthodoxy. The orthodox community is re-emerging and re-energising and can be proud of itself. As Rav Soloveitchik said, “They don’t laugh at us any more”. Orthodoxy has rising numbers, growing educational institutions, increasing levels of observance. Centrist orthodoxy, represented in the USA by the Rabbinical Council of America (RCA), is especially powerful because of its leaders and members. It has a noteworthy range of world-class scholars who are marked by a combination of Jewish, professional and academic eminence. Once upon a time people could say that when rabbis became doctors, Judaism became sick; now they are making Judaism hale and hearty. Great figures who unite rabbinic with general intellectual talents have been recruited to projects such as the RCA Siddur, which they have made into a major literary as well as communal achievement. This is not to denigrate the trailblazing work that has been done in this area by Jonathan Sacks, whose intellect, elegance and scholarship are unique in the Jewish world. Sacks’ liturgical works have deservedly won themselves a special place in Jewish affections. Where Chaim Bermant used to say that Anglo-Jewry was not a thinking community, Sacks has made it one, not least by means of his Siddurim and Machzorim. But in some respects the RCA Siddur surpasses even Sacks. Sacks is an amazing one-man scholar-team, even though he was backed by a Scholars’ Committee when he updated the Singer Siddur in Britain some years ago. The RCA Siddur in contrast is the work of a whole array of translators and explicators. Basil Herring welded their work together into a true market-place of ideas with cutting-edge freshness that upholds halachah while facing new realities. Apart from the graphics and technical aspects of the book, I tested it as a worshipper, a davener. Unlike some people, I don’t daven by heart; I use a Siddur. My litmus test starts with my eyes, which are strained by miniscule print and unattractive fonts. In this respect I don’t give high marks to ArtScroll but I do to the RCA Siddur. Though it is heavy to handle, the pages are well designed and easy to read, with subtle lessons in the occasional resort to smaller print, e.g. the Aramaic sections of the kedushah d’sidra. The Siddur ranges across the whole of one’s day, week and year. Having the whole of the Book of Psalms is a great help since there are so many occasions when chapters of Tehillim express one’s existential needs. However, many people have a kavvanah problem with prayer. Externalities keep intruding. I used to tell my High Holyday congregations not to be drawn aside by distractions including the chatty shule neighbour, but when one’s attention wavers they should ignore the service for the time being, close their eyes and think deeply about God, life, and ultimate issues. There is a kavvanah problem which is actually caused by a good Siddur like Avodat HaLev. Its annotations are so inviting that they divert one from davening. The best advice is to daven and then go back and read the notes, which are a combination of the scholarly and the devotional, teaching the mind, stretching the soul and arousing the heart. One does not always agree with what is said, but everything is highly stimulating, though one of the least satisfactory notes is on the first line of the Shema. A word of praise must be added for the essays at the end of the book. They deal with what to pray, how to pray and how to acknowledge historical experience, especially seminal events like the Holocaust and Israel. Naturally the views of the various authors will not be supported by everyone, but kol hakavod that the orthodox community has highly competent thinkers who are up to these challenges. When the Siddur is re-assessed in due course, it will need checking for typos (e.g. the word Sedet instead of Seder on page 1029), and the system of transliteration will need to be re-addressed. The use of the Israeli accent (Avodat, not Avodas) is to be commended, but I am puzzled that sometimes a feminine noun ends with “h” (“Torah”) and sometimes not (Amida). I prefer an “h” but at least let there be consistency. The RCA deserves congratulations on this Siddur. I for one look forward to davening with it and uncovering its treasures. The following article by Rabbi Raymond Apple originally appeared in the Jerusalem Post on 30 December, 2018. Antisemitism is rearing its head again. Sometimes it is a tragi-comedy, like saying that Israeli politician Tzipi Livni has smelly feet, a ridiculous notion derived from the medieval claim that Jews have a stench. More often it is a tragedy with no trace of comedy, when Jewish shops, synagogues and cemeteries are targeted, and Jews are murdered. Antisemitism’s long history evolved in three stages. In ancient times, the superpowers found the Judeans an obstinate, inconvenient people. The second stage was unleashed by Christianity, which claimed that Jews were punished for rejecting Jesus by being cursed by God. The fact that Jesus and his disciples were all Jews was inconvenient to acknowledge. Judaism allegedly led people astray. It was accused of being a Synagogue of Satan. If Jews remained Jews they had to be kept down and removed, though if they changed their faith they could change their fate. 19th century antisemitism advanced a quasi-scientific form of Jew-hatred, claiming that Jews were genetically flawed and could never escape their taint. The Church was no longer so powerful, but it had made the Jew into a devil. It had laid foundations for an increasingly secular doctrine of Jew-hatred which transferred the demonisation of the Jew to the secular world. As Jules Isaac put it, the Jew had become the eternal negative symbol of history. The Holocaust was not caused by Christians as such but they made an inexorable contribution towards its advent. Some churches rang their bells and genuflected before Hitler. When asked to protect innocent Jewish blood, they said that Jewish blood was never innocent. Yet Nazi antisemitism was not just an attack on Jews but an attack on Christianity, and the Jewish Jesus would have been one of the first victims. The Nazis dethroned God, discarded the Biblical doctrine of man’s dignity, and worshiped the gods they had created for themselves. 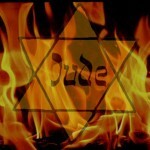 The Holocaust was an outrage against Judaism, an attack against Christianity, an insult to ethics, and a menace to Man. Lists of Jewish contributions to society, however impressive, are ineffective as counters to antisemitic prejudice because it is in the nature of prejudice not to follow reason or logic. The beast once unleashed knows no rational red lines. An excellent book by Denis Prager and Joseph Telushkin, Why the Jews? The Reason for Antisemitism, argues that it is the principal elements of Judaism that lie behind Jew-hatred: the world is challenged and shamed by the Jewish God, and the Jewish ethic of law, education, truth, charity and justice. No one liked the Jewish message so they attacked the messenger. All very true, but Prager and Telushkin think people are fundamentally reasonable. If they were, they would know that smelly feet are precisely what Jews don’t have because they are scrupulous about health, hygiene and cleanliness. They would know that Jews don’t have hooked noses – and even if they did, so what? They would know that Jews have no designs on world government other than the messianic aspiration for mankind to attain high ethical standards. They would know that Judaism teaches resourcefulness, and enabled countless Jews to be creative. But people who dislike Jews are unlikely to be persuaded to drop their prejudices. Nor are they likely to see how inappropriate it is to call Israel an apartheid state when there is a world of difference between apartheid South Africa and the way that minorities are treated in Israel. They do not see the incongruity in trying to defend the Palestinians and attacking the so-called settlements. They opposed Israel, Zionism and Jews long before the Palestinian issue and before international vocabulary spoke of settlements (though to be just, they had some respect for the idealism of the kibbutz). You don’t have to be a prophet to foresee that even if Israel and the Palestinians made peace, even if there were no settlements, antisemites would still find a reason to oppose Israel. Indeed even if there were (God forbid!) no Israel at all, they would still traduce the Jewish people. What do they have against the Jews? Their prejudice is self-contradictory. They oppose Jews because they are rich and because they are poor, because they are right-wing and because they are left-wing, because they are communists and because they are capitalists, because they are patricians and because they are plebeians, because they are entrepreneurs and because they are backbenchers, because they are universalists and because they are nationalists. They are not sure what they are hating – Jews or Israel. They shoot Jews praying in an American synagogue and they think this will change Israeli government policies. They attack Jewish children at a French day school and they think this will give the Palestinians a capital in east Jerusalem. What an irrational animal is the antisemite. Let’s posit a theory of antisemitism. The antisemite is not looking for an inhabitant of a block of flats in (say) Manchester, Moortown or Melbourne who happens to be Jewish, buys meat at a kosher butcher, sends his children to a Jewish school and prays at a certain rabbi’s synagogue. The antisemite is not looking for a specific Jewish person or a real flesh-and-blood Jew. He wants a bogeyman, a scapegoat to blame for his and his society’s problems. For him, “Jew” is a symbol, but it could be any other “different” group. In his vocabulary, an enemy who is to blame is called “Jew”. The word “Jew” is dredged up out of folk memory, but it could just as easily have been a red-head, a unionist, a talk-show host, a cricketer, a bus driver… who knows, who cares? “Jew” used to be defined in dictionaries as a person known for meanness and mendacity. Now it is code for “the person I blame”… “I blame the Jew for whatever ills I and my society suffer from”. Elsewhere, the problems are different, maybe even the opposite of mine. Every antisemite has his own Jew. That’s why one group’s Jew is the opposite of another’s. If you don’t want to be responsible for the ills of your society, find a bogeyman, find a scapegoat, find a Jew. It’s a shame there are real Jews who have to bear the burden of all this nonsense. They certainly don’t enjoy their fate. They’d much rather you chose someone else, that’s if you really needed a bogeyman. They’d much rather you faced up to your own problems and took your own share of the blame. In the meantime, while you are working it out in your own mind, give the real Jews a break, and get on with the long hard task of rooting out bigotry and blame-casting. WordPress generated this page with 35 queries, in 0.268 seconds.